Stroke. Coloured three-dimensional MRA (magnetic resonance angiography) scan of internal bleeding (red, centre right) in a stroke victim's brain. Arteries are pink. 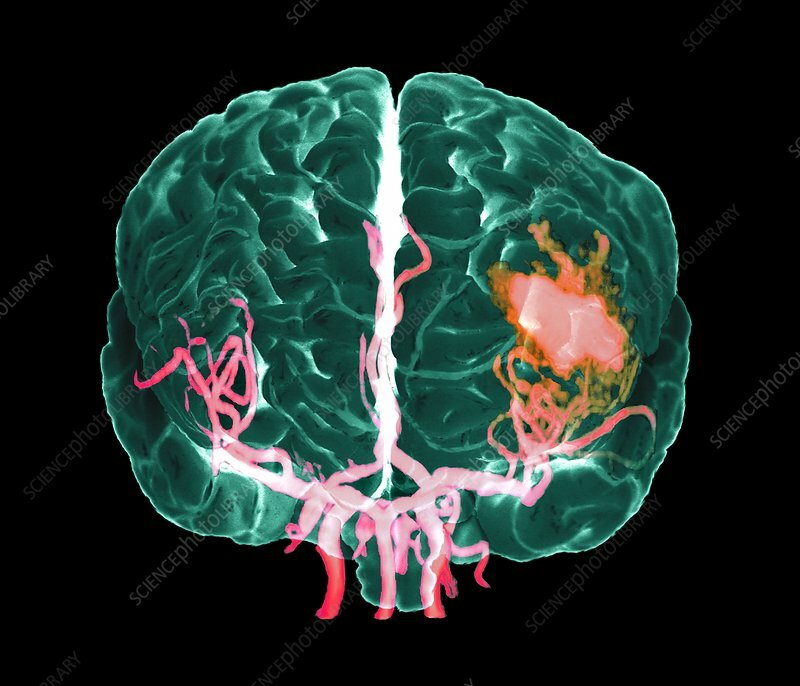 The brain damage of a stroke (or CVA, cerebrovascular accident) results from pressure from the internal bleeding. The brain is seen from the front. The bleeding is in the left hemisphere of the brain, and has caused hemiplegia (paralysis) in the right half of the body, as well as aphasia (a speech disorder). MRA is a magnetic resonance imaging (MRI) technique that highlights blood vessels. For an MRA scan of a healthy brain, see image P332/369.